General warranty deeds are statutory conveyances under KRS 382.030. The deed must state that the grantor "will warrant the property hereby conveyed" or contain words of import like "with warranty" or "with general warranty" (KRS 382.030). A warranty deed is a legal instrument used to transfer, or convey, rights in real property from a grantor (seller) to a grantee (buyer). They offer substantial protections for the grantee and are the most common type of deed for standard real estate transactions. When using a general warranty deed, the grantor warrants that they are the true owner of the property and have the legal right to convey it, that the property is free of liens or encumbrances unless otherwise listed in the deed, and that the grantor will defend the grantee's right to the property if anyone makes a claim against the title, forever. In addition to meeting all state and local standards for recorded documents, a lawful general warranty deed identifies the grantor and grantee and their addresses. State law requires information on how the grantee will vest title in the property. For Kentucky residential property, the primary methods for holding title in co-ownership are tenancy in common, joint tenancy, and tenancy by entirety. A grant of ownership of real estate to two or more persons creates a tenancy in common, unless otherwise specified (KRS 381.050(1)). Include a complete legal description of the property, and the source of the current grantor's title. State either the full amount of consideration exchanged during the transfer, or if nominal or no consideration has been exchanged, the fair cash value of the property in the consideration certificate section pursuant to KRS 385.135. The county assesses a transfer tax on the consideration, due at the time of recording, unless the transaction is exempt under KRS 142.050. Provide the in-care-of tax address where the property tax bill may be sent (KRS 382.110(2)). Kentucky law requires the preparer's name and signature on the face of the deed (KRS 382.335). Each grantor and grantee must sign the deed in front of a notary (KRS 382.030). Record the deed, along with any supplemental documentation necessary for the specific transaction, in the county in which the property is located (KRS 382.110(1)). Recording provides public of the change in owners and helps to maintain a clear chain of title. This article is provided for informational purposes only and is not a substitute for legal advice. 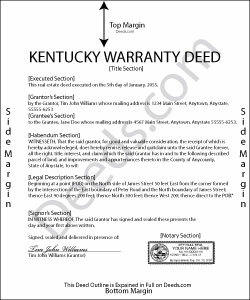 Contact an attorney with questions about general warranty deeds or for any other issues related to the transfer of real property in Kentucky. Sherry F. said: Good product and service.